We attempted to take these on a recent road trip to Sheffield, but my partner made us eat them outside the house because he didn’t want crumbs in his new car. But if your car isn’t new these would be a perfect road trip breakfast, you can make them in advance and eat them with one hand, not that I am condoning eating and driving but you gotta do what you gotta do. Note: Buy ready rolled puff pastry if you can, it needs to be cold and rolling out a solid block of cold pastry is hard. 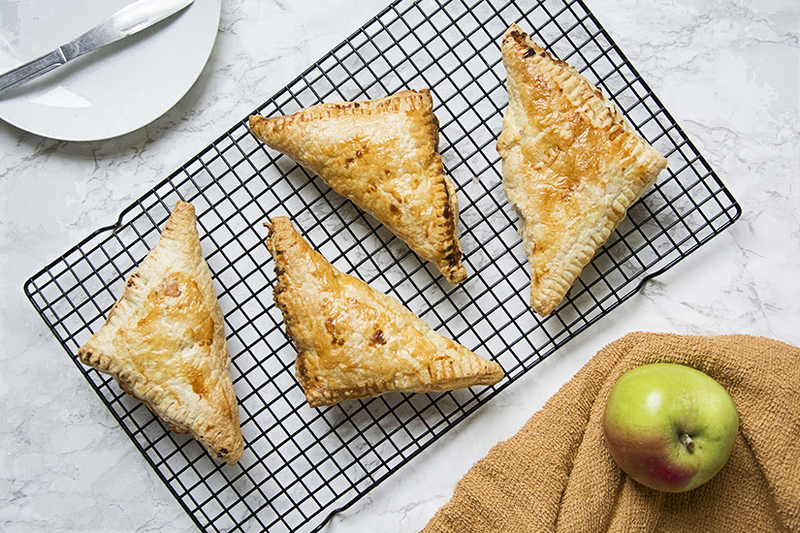 Also, you can make the filling in advance and leave in the fridge until you want to use it, its a universal filling so would be good for a variety of apple recipes. Of course, if you prefer to roll out your own I highly recommend a good rolling pin, stainless steel or marble work best for pastry as they stay cold. Available to have a look at here . Preheat your oven to 190C, line a baking sheet with baking paper. Peel, core and chop the apples into roughly 1cm chunks. Add the butter to a medium pan, melt on medium heat. Add the chopped apples, cornflour, cinnamon, mixed spice, vanilla and caster sugar. Cook over medium heat for 15 minutes stirring regularly to avoid anything sticking. Once the apples have softened set the mixture to the side to cool. Roll the puff pastry out onto a floured surface and cut into 6 squares. 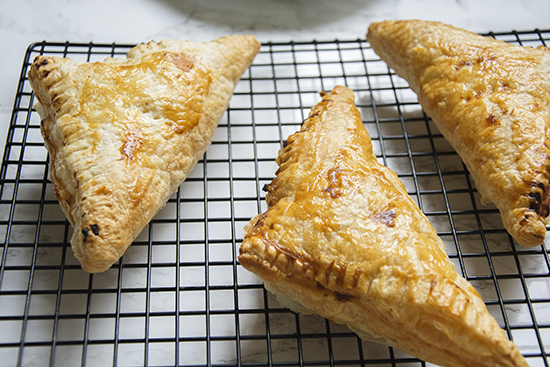 Once the filling has cooled, place a spoonful onto one-half of each of the pastry squares. Using a pastry brush (or your fingers) brush some of the beaten egg around the edges of each square. Fold each square in half diagonally, using a fork to press down and seal the edges. Lightly prick the top of each triangle with the fork to allow hot air to escape. Brush the pastries with the remaining egg and place on the baking sheet. Bake for 20-25 min or until the pastries are golden brown. When baked, remove from the oven and leave to cool on a wire rack. The filling will be very hot so don’t eat these straight from the oven. 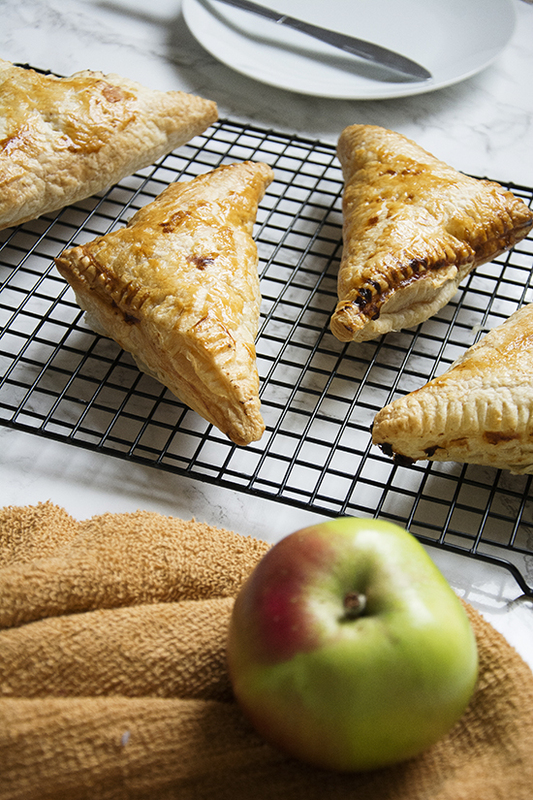 And there you have it, my easy apple turnovers, perfect for any occasion and wonderfully simple to make. 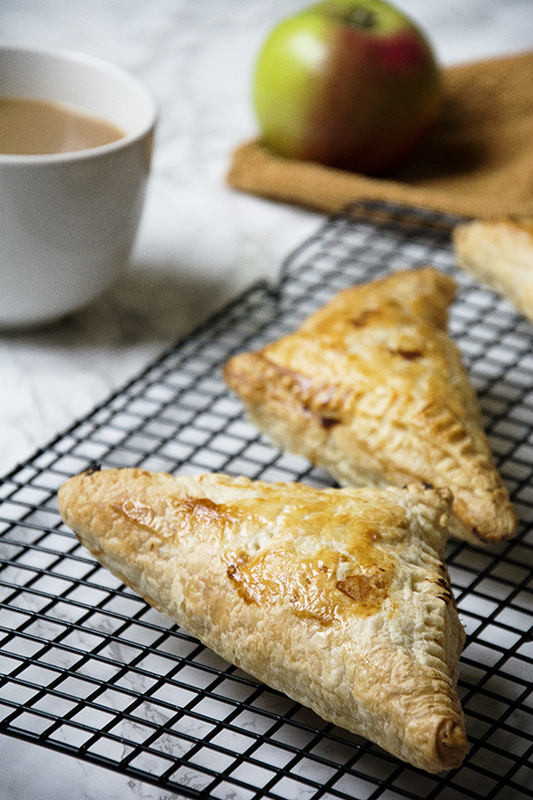 If you give these easy apple turnovers a try let me know how they go by tagging @whatseatingmanchester in your social media post. For more recipe inspiration don’t forget to check out my blog or Pinterest.